Predicting the Winner in King v. Burwell–Will Obamacare stand? The Supreme Court heard oral argument in the Obamacare case, King v. Burwell, on Wednesday in 90 minutes of extended oral argument. I’m predicting the winners based on the method of counting the number of questions. After 19 decisions handed down, my predictions have been correct 63% of the time, which means I have fallen off after going 100% correct in the first 6 decisions. King v. Burwell is the second time the Court considered the legality of Obamacare. This time, the question presented is whether the Internal Revenue Service may permissibly promulgate regulations to extend tax-credit subsidies to coverage purchased through exchanges established by the federal government under Section 1321 of the Patient Protection and Affordable Care Act. The first time around, Chief Justice Roberts joined the 4 liberal Justices to uphold the constitutionality of the Act. This time around, it looks like the Chief holds the decisive vote again. 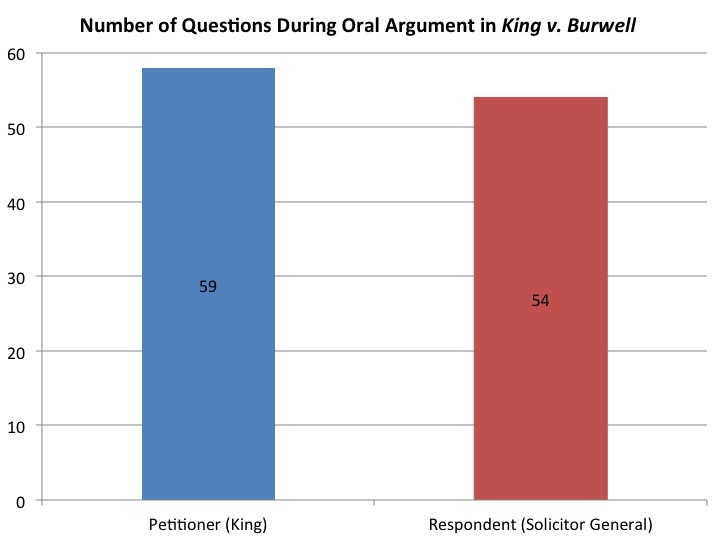 As Figure 1 above shows, the total question count favors the Respondent (Solicitor General), who received 5 fewer questions. But the question count by Justice tells the real story. Not surprisingly, the Justices split along ideological lines. Four conservative Justices asked the Respondent (SG) more questions: Chief Justice Roberts (+2), and Justices Scalia (+14), Kennedy (+3), Alito (+18). Notice, though, the differential is very small for Chief Justice Roberts, who asked only 4 questions total in the 90 minute session (far fewer than he asked in the first Obamacare case): the Chief asked 1 question to the Petitioner (which was more of a helpful comment to help the Petitioner explain why he changed his position from the first case) and 3 questions to the Solicitor General (two about standing, which doesn’t seem it will be an issue and one about Chevron deference). Chief Justice Roberts may have been purposely playing things close to the vest, knowing that Court watchers expect him to be the key vote again. Likewise, Justice Kennedy had a modest differential of 3 more questions for the Solicitor General–7 questions to the SG compared to 3 questions to the Petitioner. But some of those questions related to the possible application of the doctrine of constitutional avoidance, which, if applied, would favor the Solicitor General. The four liberal Justices all asked the Petitioner more questions by substantial amounts: Justices Ginsburg (+15), Breyer (+9), Sotomayor (+6), and Kagan (+13). So who wins? It’s a toss up. Remember, of course, that I am basing my predictions based on the question counts (total and individual). Based on the small differentials of the Chief Justice (+2) and Justice Kennedy (+3) that slightly favor the Petitioner, I will go with the Petitioner (King). I am also swayed slightly by the fact that the Chief Justice asked no substantive questions to the Petitioner. These are very small differentials and Justice Kennedy especially has not been easy to peg in the past based simply on his question count, so my confidence level is not high. As the press has reported, in his questions, Kennedy floated a theory of constitutional doubt that would, if applied, favor the Solicitor General. But if I stick to the question count method, Kennedy’s question count favors the Petitioner. That’s as far as this method will go. At least we know who holds the swing votes. With all due respects, this article tells us absolutely nothing. Everybody already knows who the swing votes are. You’re predicting a plaintiff victory on nothing more than the fact that Roberts and Kennedy COMBINED asked five more questions of Verrilli than they did of Carvin? I’m not saying that the administration will definitely win, but those questions posed by Justice Kennedy to the plaintiffs indicated an enormous amount of skepticism and concern with the arguments put forth by the law’s challengers. Also, Chief Justice Roberts, while he may not personally agree with the Affordable Care Act has deep concerns about his court being regarded as a politcally-partisan machine. Remember, the plaintiffs need to convince BOTH Kennedy and Roberts to support their argument, while the administration only needs to convince one of them. Thanks, Kevin. Unfortunately, that’s the limitation of the question-counting method. It’s not my method, it’s what others (including Roberts himself) have identified. I’m simply applying what others have identified. You and others are free to evaluate the skepticism or not in a particular question of a Justice. I find that enterprise too subjective to be able to apply on any consistent basis. But I share the data on the question count so people can make up their own minds on all available information.